Subwoofer Size: Single 12". Subwoofer Firing Direction: Up-Firing. Vehicle: Dodge Ram Quad/ Crew Cab 2002-2018. © 2018 AVLeaderz. Leader Dealz. Car Audio & Video. Car Security & Safety. MDF Thickness: 5/8" Industrial Grade MDF. This is a very good quality box! This is a sealed slanted enclosure that fits easily behind or under most vehicle seats. This is a great option for a sub box when space is limited! 5 3/4" Mounting Depth (depth at the center of the mounting hole). Just cut your speaker hole and mount the Pod through the external flange using the fastener of your choice. They are designed for easy flange mounting! This will give you that clean Professional look! Subwoofer Size: Double 12". Subwoofer Firing Direction: Up-Firing. Air Space: 0.69 Cubic Feet/ Per Subwoofer. Vehicle: Dodge Ram Quad/ Crew Cab 2002-2018. © 2018 AVLeaderz. Leader Dealz. Car Audio & Video. Vehicle: Toyota Tundra CrewMax 2014-2018. Subwoofer Size: Double 12". Subwoofer Firing Direction: Front-fire. © 2018 AVLeaderz. Leader Dealz. Car Audio & Video. Car Security & Safety. Prices, specifications, and images are subject to change without notice. Subwoofer Size: Single 10". Subwoofer Firing Direction: Up-Firing. Vehicle: Dodge Ram Quad/ Crew Cab 2002-2018. © 2018 AVLeaderz. Leader Dealz. Car Audio & Video. Car Security & Safety. MDF Thickness: 5/8" Industrial Grade MDF. See below for more details. Manufacturer Refurbished Enclosure with New Subwoofers. 12″ CompRT 2 Ohm Enclosure. Blown Subwoofers or Speakers: Blown subwoofers or speakers are defined by the manufacturer as a user defect and can not be warrantied. Superior performance backed by quality materials is what you can expect from this 6.5" speaker enclosure. • Miter & Dado Construction with Premium Carpeted Finish. Speaker Wire. • Mounting Hole Width: 5-3/4". Vehicle: Toyota Tundra CrewMax 2014-2018. Subwoofer Size: Double 10". Subwoofer Firing Direction: Front-fire. © 2018 AVLeaderz. Leader Dealz. Car Audio & Video. Car Security & Safety. Prices, specifications, and images are subject to change without notice. Subwoofer Size: Dual 10". Subwoofer Firing Direction: Down-Firing. Vehicle: Nissan Titan King/Crew Cab 2004-2018. © 2018 AVLeaderz. Car Audio & Video. Car Security & Safety. MDF Thickness: 5/8" Industrial Grade MDF. MADE IN THE U.S.A. --- IN TEXAS --- WATCH OUR VIDEOS! Subwoofer Size: Single 12". Subwoofer Firing Direction: Down-Firing. Vehicle: Ford F150 Super Cab/ Extended Cab 2009-2018. © 2018 AVLeaderz. Car Audio & Video. Car Security & Safety. MDF Thickness: 5/8" Industrial Grade MDF. Subwoofer Size: Double 12". Subwoofer Firing Direction: Rear Firing. Vehicle: Chevy Camaro 2016-2018. © 2018 AVLeaderz. Leader Dealz. Installation instructions: Installs through Rear Seat Opening. Car Audio & Video. Just cut your speaker hole and mount the Pod through the Sealed Full bottom using the fastener of your choice. They are designed to conceal the mounting screws beneath the speakers! This will give you that clean Professional look! Woofer Opening fits a 12" Subwoofer. NIPPON 12" SUBWOOFER TUBE BOX. Car Audio Speakers. Car Audio Subwoofers. Car Audio Power Wire. Car Audio Dash Kits. Car Audio Tweeters. Car Audio Wiring Accessories. With the use of quality materials, precision cutting and detailed constructing SoundBox is able to build a premium enclosure. Vehicle Specific Subwoofer Enclosure. Subwoofer Enclosures. Subwoofer Size: Double 10 ”. Speaker Wire. 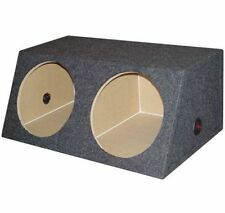 Atrend 4 Way 6" x 9" Speaker Box. • Opening fits a 6" x 9" Speaker. • Bottom Depth: 5-7/8". • Top Depth: 4". Car Audio Power Wire. Car Audio Speakers. Car Audio Subwoofers. Subwoofer Size: Double 12". Subwoofer Firing Direction: Rear-Firing. Vehicle: Chevy Camaro 2010-2015. Car Audio & Video. Car Security & Safety. MDF Thickness: 5/8" Industrial Grade MDF. Pro Audio & Lighting. GMC Sierra/Chevy Silverado Subwoofer Enclosure Ext Cab Dual 10" 2007-2013. Subwoofer Size: Double 10". Subwoofer Firing Direction: Down-Firing. Air Space.60 Cubic Feet/ Per Subwoofer. Vehicle: Chevy Silverado Extended Cab 2007-2013 (Does not fit 2007 Classic Body). Just cut your speaker hole and mount the Pod through the external flange using the fastener of your choice. They are designed for easy flange mounting or can be mounted through the bottom! This will give you that clean Professional look! Subwoofer Size: Triple 12". Car Audio & Video. Car Security & Safety. MDF Thickness: 1” Industrial Grade MDF Front Baffle, 3/4” Surround. Chambers: Separated. Prices, specifications, and images are subject to change without notice. With the use of quality materials, precision cutting and detailed constructing SoundBox is able to build a premium enclosure. Vehicle Specific Subwoofer Enclosure. Subwoofer Enclosures. Subwoofer Size: Double 12 ”. 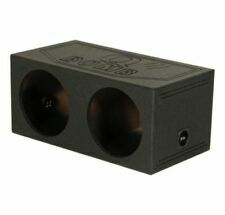 6 1/2" MARINE CNT Speaker Universal Pod Mount Custom Pods Car Enclosure 6.5"
Subwoofer Size: Single 12". Subwoofer Firing Direction: Down-Firing. Vehicle: Chevy Silverado Extended Cab 2007-2013 (New Body style 2007 Only). Vehicle: GMC Sierra Extended Cab 2007-2013 (New Body Style 2007 Only). Orion Ztreet Series 6" x 9" Two Way Coaxial Speakers ZTC-692. Are you looking to get LOUD?. These speakers are part of Orions Ztreet Series. These are 6"x9" 2-way coaxial speakers with a 1" high temperature voice coil and 2-1/2" Mylar Cone Midrange. Subwoofer Size: Double 10". Subwoofer Firing Direction: Down-Firing. Vehicle: Chevy Silverado Crew Cab 2014-2018. Vehicle: GMC Sierra Crew Cab 2014-2018. © 2018 AVLeaderz. Car Audio & Video. Car Security & Safety. Ford F250/F350 Super Duty Crew Cab Double 10" Subwoofer Enclosure 2004-2016. Subwoofer Firing Direction: Front Firing. Subwoofer Size: Double 10". Vehicle: Ford F250/F350/F450/F550 Super Duty Crew Cab, 2004-2016. 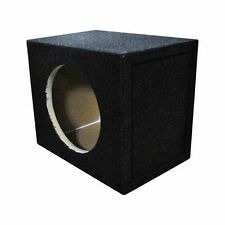 PORTED Subwoofer Sub Box for 2016 Ford F150 Super Crew Cab Supercrew 1-12"
Fits the 2016 Ford F150 Supercrew Cab. Subwoofer Mounting depth based on the most common size subwoofers. Subwoofer Mounting Depth: 5.00". Subwoofer Airspace: Approx. ft. Per Sub/Side. Our subwoofer enclosures are CNC cut and hand assembled here in the USA. 1" MDF Face, 3/4" for the rest. Height: 17". Depth: 17". 2002-2012 Dodge Ram Quad / Crew Cab Truck Custom Dual 12" Subwoofer Enclosure Sub Box. The DTB2X12-QUAD-UP sub enclosure is designed specifically for the 2002-2012 Dodge Ram Quad / Crew Cab Truck. The sub box houses dual 12" subwoofers and. Peak: 1500W Total. TS-SWX3002 - Pioneer 12" 400W RMS Sealed Enclosure Type Subwoofer. Preloaded with a 12" Shallow Mount Subwoofer. 1500 W Max 12" 4-Ohm Subwoofer in Sealed Enclosure. Subwoofer Features. 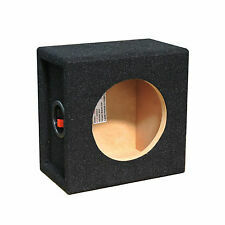 10" Single Sealed Slim Shallow Mount Sub-Woofer Enclosure Box. 10" Single Sealed Ultra Slim Series Subwoofer Enclosure. Superior performance backed by USA made quality is what you can expect from this enclosure. 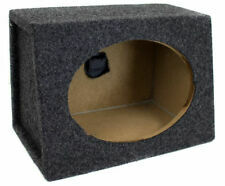 6 1/2" CNT Speaker Universal Pod Mount Custom Kick Pod Enclosure 6.5"
1" MDF Face, 3/4" for the rest. Width: 21". Depth: 18". Height: 16.25". 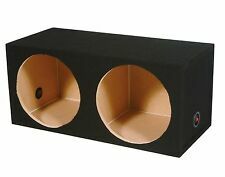 BLACK 12" DUAL PORTED SUB BOX. NOT ALL 12" SUB'S WILL FIT. -MOUNTING DEPTH: 14". -DEPTH: 17 1/2". -LENGTH: 33". -HEIGHT: 13 1/2”. THIS IS FOR (2) PCS SPRING LOADED SCREW IN SPEAKER JACK. THESE ARE HIGH QUALITY JACKS WITH AIR TIGHT SEALS. DONT FORGET YOUR CUSTOM MDF RINGS FOR YOUR BOX.